Our Bachelor of Business (Honours) with International Business allows you to enhance your qualifications by topping up to a level 8 degree. This bachelor of business degree focuses on how organisations operate, what they perform, their styles of management and their business strategies. The overall objective of the programme is to provide you with in-depth knowledge and expertise in international business. It provides students with the knowledge and skills required to manage and work in either local or multinational corporations, or more generally in the global context. The Bachelor of Business degree programme classes take place in the Galway Business School, which is located on the Salthill promenade in the historical city of Galway. 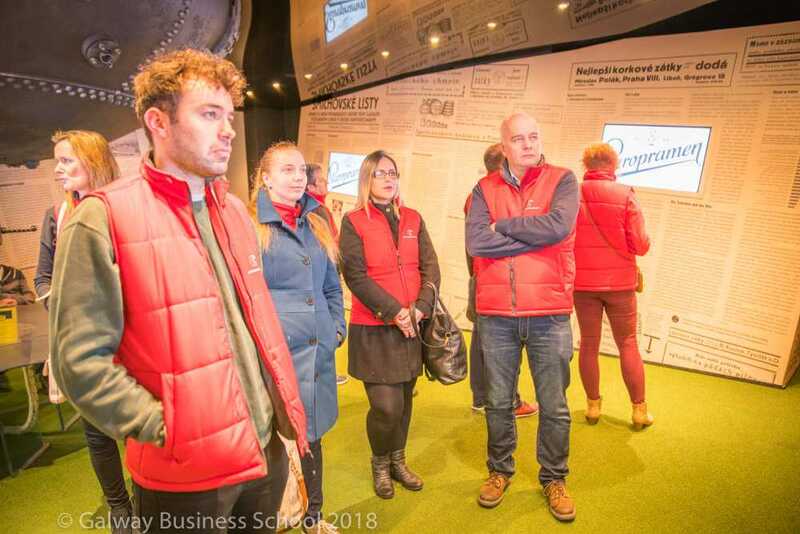 "What sets us apart from other colleges are our small, interactive classes"
This, coupled with our excellent links with local businesses, will provide you with an education rich on every front. Develop your ability to critically analyse and comprehend the latest thinking, theories, frameworks in best business practice in a number of disciplines. You will be able to apply this in your workplace. Be able to identify how global strategies develop and diversify and track the outcomes of implemented organisational decision-making. Enhance your communication skills so you can effectively and confidently communicate information, ideas and solutions in both written and spoken forms. Learn how to analyse the cognitive, technical and varying structures of the international sphere, as well as the complex nature of contemporary global business commerce. Be able to employ both cognitive and creative skills to exercise critical thinking in solving global business problems with intellectual independence, which are essential attributes for managers in an international business setting. Emerge confident, work ready and be more employable in an international business setting. International students can only apply for this programme on a full-time basis. To get advice on your International qualification visit www.naric.ie. NARIC Ireland provides free advice on the academic recognition of a foreign qualification by comparing it to award types and levels on the Irish National Framework of Qualifications (NFQ). For non-native speakers of English a level of 6.5 IELTS + or its equivalent is required. For more information on the Bachelor of Business (Honours) with International Business degree programme entry requirements you should contact the Galway Business School directly. This programme is delivered on full-time day basis which includes face-to-face lectures, tutorials and online activities Monday to Thursday over two semesters. Additionally, academic workshops and demonstrations will also be scheduled as required throughout year to enable learners to gain a better understanding of your coursework. The programme places an emphasis on the practical application of theory. This is supported by problem based learning through various mediums, such as case studies and group activities, and research based learning such as business research projects. Exercises like online business simulations and new business planning projects, will foster imaginative thinking among you and your classmates. Our small class sizes ensure you have close interaction with our industry experienced academic team who are passionate about motivating you to achieve your best. Throughout the Bachelor of Business (Honours) degree programme we use various assessment techniques to test the academic abilities, capabilities and competencies of our students. These assessment techniques compliment different adults learning styles and ensure learners can reach their full potential. Students will be assessed on a continuous basis during the academic year. Continuous assessments can be carried out through; written examinations, presentations, individual and group project and mock interviews. Lecturers will ensure students are fully prepared for assessments and are happy to answer any questions you may have on the assessment process. Learners who are considering doing Bachelor of Business (Honours) degree programme may ask "Is it worth doing a Honours, Level 8 degree?" or "What jobs can I get after the degree?". Well the answer is yes, its is definitely worth obtaining a Honours, Level 8 degree. Graduates of this programme are more employable in SMEs and multinational organisations in Ireland and worldwide. The Bachelor of Business (Honours) with International Business degree programme prepares learners to successful move into management positions and have the confidence to partake in the strategic decision-making in an international context. Previous students who have completed the Bachelor of Business (Honours) degree programme have continued in their studies and applied for Masters and postgraduate courses in Ireland, Europe and Worldwide. Others students have been successful in gaining access to graduate programmes in the some of the top companies in Ireland.